Heat a small pot of oil to 285°F and maintain the temperature. On a French mandolin with the ridged teet set in place and the thickness set to 2-3 milimeters, begin to slice the Yukon gold potatoes. In beween each slice of potato, turn the potato 90°F to form the cross hatched pattern. Discard the first slice, as it will not have the complete pattern on it. Slice 8-10 pieces of potatoes and then using a 1½ inch ring cutter, cut out 8-10 rounds of potatoes. Save the excess potatoes for another use. Gently place the round slices of gaufrettes into the pot of oil and cook until they are light, golden brown, about 6-8 minutes. Place the cooked gaufrettes onto a paper towel lined plate, season with salt and set aside in a warm, dry place. In a medium sized mixing bowl, place the crème fraîche, black pepper, vodka, and a pinch of salt, and begin to whisk. Make sure the crème fraîche and vodka are cold, or it will not whisk properly. Adjust the seasoning by incorporating more crème fraîche, vodka, pepper, or salt and re-whisk to soft peaks if needed. Place the beef in a small mixing bowl and season with a pinch of salt, the diced ginger, chives, Dijon mustard, a splash of canola oil and red wine vinegar. Mix all the ingredients and check for seasoning, adjust if necessary. Place the langoustine in another mixing bowl and season with salt, a squeeze of lemon juice, and extra virgin olive oil. 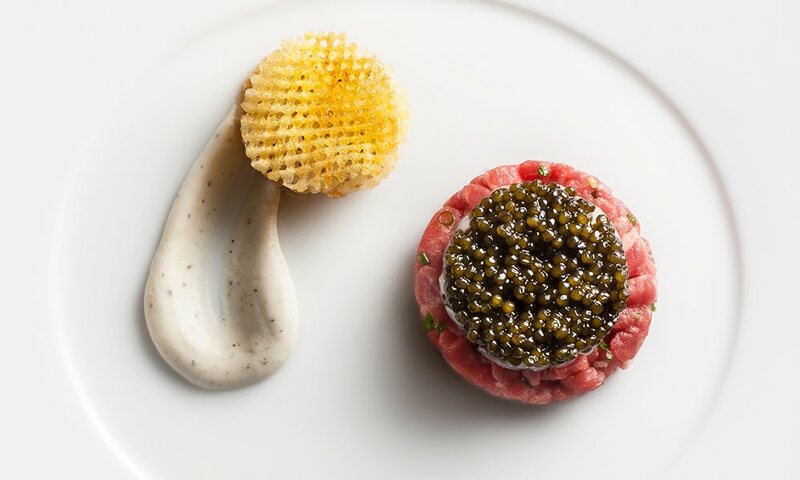 Using half the beef tartare, place a 2-inch diameter “patty” slightly off center to the right on a plate. On top of the beef patty place half of the langoustine tartare in a round “patty” as well. Finally place half the caviar on top of the langoustine. With a spoon, take a 1 tablespoon round dollop of the creme fraiche sauce and place it to the left of the tartare. Drag the tip of the spoon from the center of the dollop of creme fraiche and form a curved “swoosh” towards the top of the plate. Make another plate with the remaining components and serve immediately.